"This is gonna be fun," Caleb voiceovers walking into the Reward Challenge and every person watching know this is horrible foreshadowing. The challenge itself is one we've seen before: race through obstacles, dig for bags of balls in a defined area, and end the challenge with a round of skee ball. On the line? Kitchen supplies, coffee, and spices. Like it's 1492 and it's the new world. But what is normally an easy challenge is only exacerbated by the extreme heat (pushing 120 degrees), and the first tribe doesn't find all three bags until over 45 minutes of digging. Um, I think these were buried unnecessarily far for a reward to win a cup of coffee. The Brains tribe wins reward while the other two tribes continue to suffer through digging in the sand. Then it all starts to get messy. Now able to rest, Debbie lays down from heat stroke and requires medical attention who cover her in water and shade her skinny body with an umbrella. Meanwhile, the Beauty tribe finds their last two bags and begins their tired round of skee ball as Brawn begins to catch-up, but not fast enough and the Beauties win the salt and pepper. Caleb AKA Beastmode Cowboy wanders off to find shade and suddenly, he's down and medical is rushing to his side.As if it couldn't be worse, Cydney can't stand up and is brought to the shade from her heat stroke - again requiring medical attention. 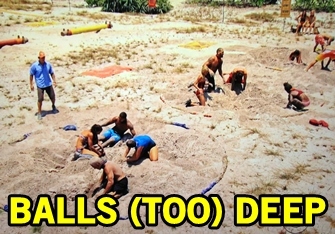 It's absolutely horrifying to watch the suffering as medical and the entire crew tends to contestants, especially as Caleb's condition doesn't seem to improve like the women and he's given oxygen. The water and shade is able to stabilize Cydney, but Caleb is virtually non-responsive and the chopper is brought in to medevac him from the game. Truly one of the hardest things to watch as a viewer, and surely one of the worst days of the lives of every person out there. Good news though: Caleb is fine and well now and hopes to play again. After the challenge, Debbie thanks Aubry (and the other Brains not there with her) for taking care of her when she was down. The Brawn tribe, however, is not as lovey dovey. Alecia is annoyed that during the challenge Scot brushed off her encouragement of teamwork and called her a cheerleader. She continues the argument with Scot which then becomes 2-on-1 when Jason jumps to Scot's side, annoyed that Alecia doesn't take responsibility and then cackling that she expects to last until a shuffle. So that makes the rest of the episode anti-climactic as the Brawn tribe loses the Immunity Challenge and wants to vote Alecia out immediately on the beach since it's a foregone conclusion. Thankfully Alecia declines and at Tribal Council we are told why Alecia is considered a Brawn: because she doesn't take lip from anybody. It's news to everyone. Alecia doesn't listen to the guys because she doesn't respect them, and the feeling is clearly mutual. 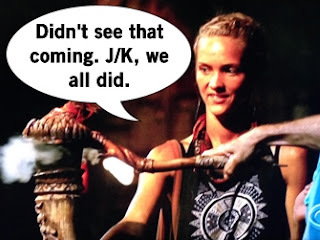 It's a quick and easy Tribal Council and Alecia is finally eliminated from the game.